$750 rebate on select new untitled Toyota and all new untitled Scion models when you finance or lease through a Toyota dealer and Toyota Financial Services. Plus, enjoy competitive APRs on all new untitled Toyota and Scion vehicles as well as Toyota Certified Used. *College Graduate Finance Program in valid on the lease or finance (including preferred option) of select new untitled Toyota models or Toyota Certified Used Vehicles (TCUV) or Scion Certified Pre-Owned vehicles; College Graduate Rebate is only available on new untitled Toyota Camry, Camry Hybrid, C-HR, Corolla, Corolla iM, Prius (excl. Prius Prime), Prius c, Prius v, RAV4, RAV4 Hybrid, Tacoma, Yaris, Yaris iA, and 86 vehicles (TCUVs and Scion Certified Pre-Owned vehicles are not eligible for the Rebate Program). 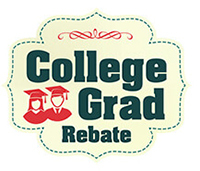 The College Graduate Rebate Program and College Graduate Finance Program are available upon credit approval from the execution of a finance or lease contract through a participating Toyota dealer and Toyota Financial Services (TFS). Not all applicants will qualify.